My 'Precious Metals' DT piece this week for the Stamp Man is a bound journal with the theme of gold to it. I have stayed away from the Olympic medals, just because I didn't have any inspiration for it. But any metals will be fabulous to see on your projects. The lovely Angela is hosting this week so do pop over and see the amazing samples from the team. 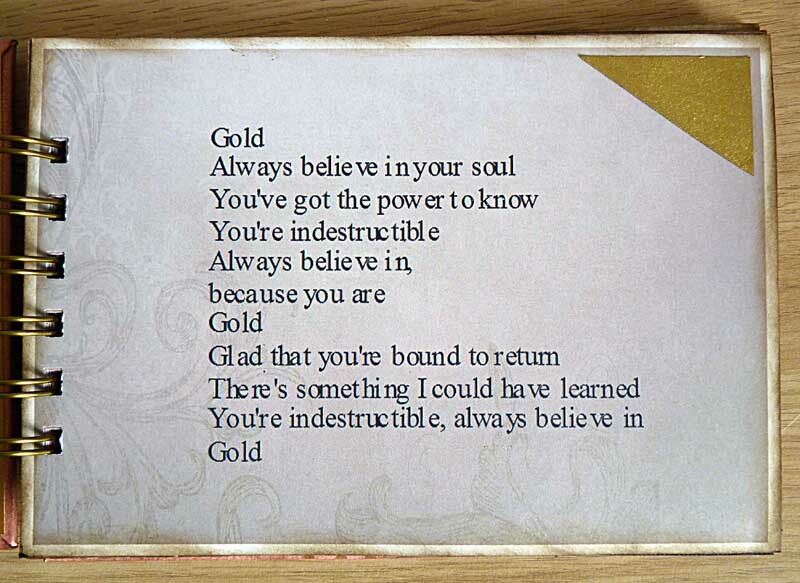 The frame on the front of my book was cut from gold metal sheet, put through an embossing folder. painted with brown acrylic paint, sanded down and gold inka gold rubbed into it. I then added some aged gold embossing enamel on the edge and some on the front and back cover too. 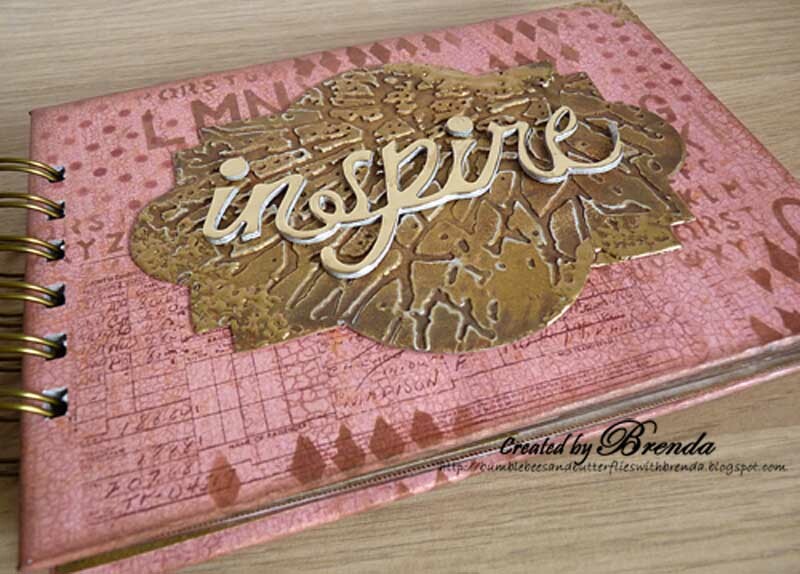 The inspire phrase was cut from gold mirri board stuck onto greyboard and die cut. 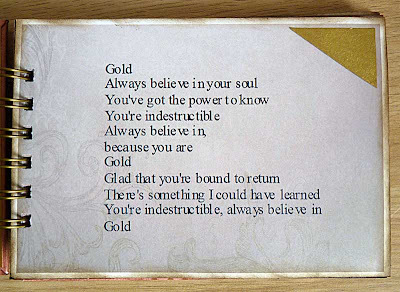 I found the words to Spandau Ballet's song and printed out onto paper for the opening of the book and of course other gold can be added when the book is made up. Jill is offering the winner a £10 voucher to spend at the Stamp Man On-line Store, you never know this could be you! 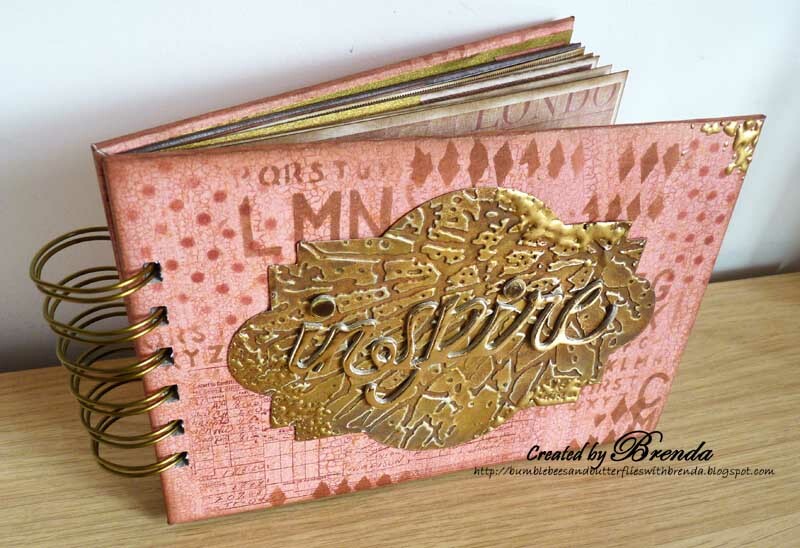 FABULOUS project - love what you did with the mirri card. I understand you have now been in to a Michaels too - I hope you had a 40% off voucher! Brenda, I saw this incredible book over at Terry's Blog. There is no doubt she will fill this with special photos and memories of your time together. Oh wow... this is fabulous . I just love the embossed metal on the front. Dear Brenda, your book is beyond gorgeous! A fabulous project. 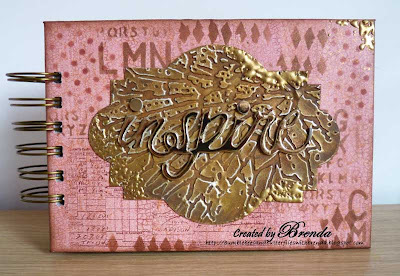 Love the golden textured background with inspire on it. Wowzer Brenda this is yet another one of your awesome works of art the front of the journal looks amazing and what wonder there is on the inside, amazing creation. Sorry to hear you didn't find much to attract your credit card in Michaels this trip but pleased to hear you found somewhere else instead. I buy basics from there (and Joanns) now and find the independent stores more interesting - let me know if you are planning to hit Florida and I'll send you some pointers! Fabulous book, I love it. By the way did you get my e-mail? Wow Brenda. I love your journal. What a fantastic gift. I am sure it will be used with love and treasured. Your journal is marvelous!!! I love how you did the cover and the song is perfect for the gold theme. This is a fabulous journal Brenda, love the variety of stamped pages that I'm sure Terry will enjoy filling.